Is Dua Lipa Lesbian ? Dua Lipa, 22, is well known English singer, songwriter, and model. She began her musical career since 2011 at the age of 16, she used to did the cover songs. In 2015, he released her first single which was quite hit. She won the EBBA Public Choice Award in her career. Dua Lipa was born on 22 August 1995 in London, England to Albanian parents. She holds a British nationality and belongs to the white ethnicity. She was a part-time student at Sylvia Young Theatre School. Lipa grew up by listening to her father, Dukagjin Lip songs. She has two siblings; a sister named Rina and a brother named Gjin. She first uploads her cover song on Youtube at the age of 14. Lipa along with her family moved to London from Kosovo to pursue her musical career. Lipa began her professional career since 2015, she released her first single New. The single was produced by Emile Haynie and Andrew Wyatt and she describes her musical style as "dark pop". The same year, she launched her second single "Be the One" which helps her to gain public attention. In 2016, she came up with her third single, Last Dance which became a worldwide hit, especially in the United Kingdom. Later she released her number of songs which all marked as successful. In 2017, Lipa collaborated with Martin Garrix and released her single titled, "Scared to Be Lonely". The same year, she released her self-titled debut studio album. 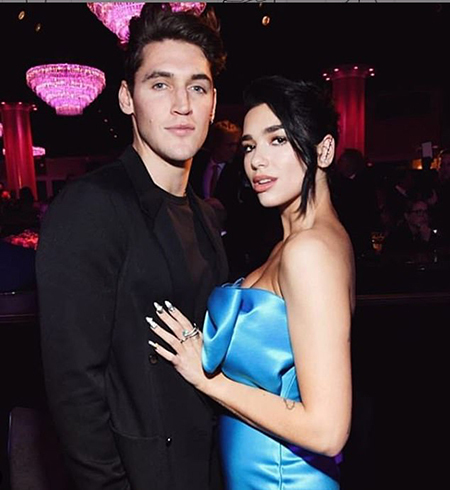 Teen sensation, Dua Lipa is an on-and-off relationship with British chef Isaac Carew since 2015. The couple often spotted together at several public events. Dua Lipa with her boyfriend, Isaac Carew. Prior to that, she dated LANY frontman Paul Klein but due to some personal issue the couple couldn't handle their relationship and had broken up. As per some online sources, Lipa earns $1 million yearly and her net worth is estimated to be $6 million. She is actively involved in modeling and singing which helps her to increase her net worth. Isaac Carew is a British model and chef. He came to limelight for his website The Dirty Dishes, which is dedicated to easy, healthy meals. Paul Klein is the Frontman and lead vocalist of the synthpop trio LANY. He's a recognized model and worked with notable brands.